Maladu or Pottu Kadala Ladoo is very famous in the Thirunelveli district. Maladu is a favourite of mine. This is my perfect snack. It's so ridiculously simple to make. . For every family, there is a traditional sweet that is made for every special occasion It is a big ball that is prepared and given for all functions and celebrations. It has a melt in the mouth texture and is typical of Tamilian Brahmin Cuisine. I make them very often. You can keep the mixed pottukadali/sugar powder. Whenever you need the ladoos, just warm the ghee and make them. until it reaches a consistency where you can comfortably roll them into lime-sized balls. 3. Heat 1 tbsp of ghee in a small pan and fry cashews till golden brown. 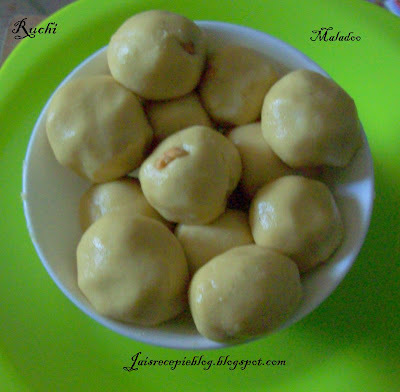 5.It is the best sweet and it consumes less time.. Add warm ghee to make balls so that tha ladoo will not stick to the hands. Yasmeen has created this lovely award and Vidhas joins her in passing it to me... It looks very cute. Thank you both for thinking of me. I feel honored & happy to receive it!! I would like to pass this to all my blogger Friends. You r back!! So nice..Maaladu looks yummy and delicious..Superb.. Welcome back! Ladu looks lovely! shinning laddoos... send me the whole.. congrats for the award. 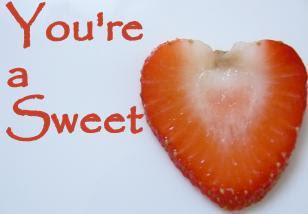 Indeed u r a sweet hrt. Nice laddoos.. looks soft & perfect..
Jaishree, I have something for u in my blog. Pls check! looks so yummy and nice texture. Thank u usha, Desha, sriharivatsan,Anu,Hema, priya, sripriya, rekha for your sweet commnts. jaishree looks so yum, never tried this kind, will give a try. nice texture and color! Too good! romba nalla iruku! Jaishree, Maladdu looks delicious. One more award is waiting, come and grab it. mmm. laddu looks so mouth-watering. Congrats on your award! Looks wonderful Jaishree,felt nostalgic.Maladu was given to my inlaws by parents during my wedding,am sure u wud be able to relate it,typical tirunelveli custom.Yummy!